Jason admires his handiwork in Friday the 13th Part VI: Jason Lives. 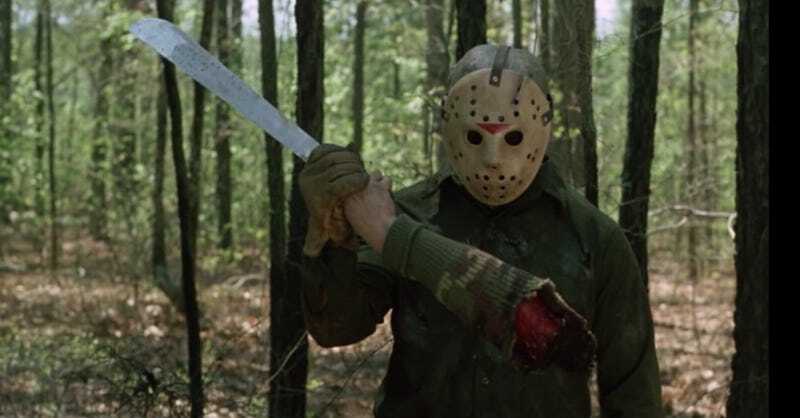 Since 1980, hockey-masked slasher Jason Voorhees has starred in 12 movies, including the Friday the 13th remake, the one set in space, and that one where he fought Freddy Krueger. Friday the 13th: Part 13 certainly has a catchy ring to it, but the reality is that the proposed sequel has been in struggle mode for years. We have a suggestion: Stop trying. Please. Before anyone flings a machete in this direction, we’re saying this out of love. The highly popular, hugely profitable Friday the 13th series has rightfully earned its place in horror history. The 1980 original is an influential genre classic; 1984's fourth installment, misleadingly subtitled The Final Chapter, is a bona fide cult classic. Even the less-beloved installments have some high points and are generally amusing, with the possible exception of the paralyzingly dull Friday the 13th Part VIII: Jason Takes Manhattan (another misleading subtitle, since most of it takes place on a dimly-lit boat). Though the most recent Friday the 13th series entry came out in 2009—in the form of a remake starring Supernatural’s Jared Padalecki and The Flash’s Danielle Panabaker—Jason’s true heyday ended in 1993 with Jason Goes to Hell: The Final Friday (which is obviously yet another misleading subtitle.). That’s because, in 1996, Scream raked in huge box-office dollars with its smart, self-referential, but still scary-as-hell take on the slasher genre, which after 15-plus years had become predictable and formulaic. Post-Scream, it became unthinkable to release another slasher movie that wasn’t filled with winks and in-jokes. So the Friday the 13th factory went dark for awhile, then turned to scifi for 2001's Jason X, which sent Crystal Lake’s most bloodthirsty resident into outer space. Jason X was decently fun, as was 2003's Freddy vs. Jason, though the long-awaited crossover between the two biggest boogeymen of the 1980s would’ve probably been more potent had it been released 10 years earlier. Blame the Scream effect, which is especially fitting (considering Scream was directed by A Nightmare on Elm Street creator Wes Craven); or you can blame the movie for being too chicken to declare a clear winner in the end. Then came the remake, which was released amid Rob Zombie’s various takes on Halloween and just prior to the 2010 re-do of A Nightmare on Elm Street. It was directed by Marcus Nispel, the same dude who did the 2003 Texas Chainsaw Massacre remake. Whatever merits these newer versions might’ve had, there was no overcoming the fact that the original films were classics that didn’t need to be remade in the first place. And it was hard to shake the feeling that the remake trend was merely a cash grab, not to mention a big sign that Hollywood had no idea what direction to take the horror genre. Case in point: The next big trend involved way too many “found-footage” flicks. Which brings us to Friday the 13th: Part 13, which has been spinning its wheels in development hell for years—it was first slated for 2015 and then 2016, then briefly claimed what would’ve been the slam-dunk release date of Friday, October 13, 2017 before ultimately being taken completely off the table. It was apparently meant to be an “origin-ish” story, exploring the early life of Jason’s mother, Pamela Voorhees—the first film’s actual machete-wielding killer—as well as potentially his never-seen father. Perhaps it would have explained what hellish part of Jason’s DNA gave him super-strength, not to mention the supernatural ability to resurrect himself, time and time again, movie after movie. The fact that Part 13 was going to be neither found-footage film nor yet another tale of giggly camp counselors-meeting-horrific fates on the archery range was promising—but in all the release date changes and leaked script info, it seemed like nobody stopped to ask the real question: Do we really need an origin story for Jason Voorhees? Remember what happened when Rob Zombie tried to explain why Michael Myers was a kill-crazy maniac in his Halloween movies and came away with “his family sucked”? Which brings us back to our original plea: We don’t need another Friday the 13th movie. Even if nobody’s actively working on one now, you know someone will try eventually. But, listen, Jason’s already had an iconic career marked by a ludicrously high body count. He has been to space, hell, and New York City; he’s ruined countless camping trips, slashed at the camera in eye-poppingly corny 3D, brawled with Freddy, and helped jump-start Kevin Bacon’s nascent acting career. A detailed origin story would almost certainly circumvent everything that’s scary about Jason in the first place, which is that he’s a totally blank, unknowable figure. We don’t really know what makes him tick, beyond the fact that he’s a mama’s boy, and we don’t want to know. No matter how great the temptation might be to make a 13th Friday the 13th film, and even if the Halloween reboot (which we’re genuinely excited for) is a big hit, it’s time to leave Friday the 13th at the bottom of Crystal Lake for good. Just watch The Final Chapter again instead, and pretend that’s what it really is.